As the anxious young Tobias begins his journey into the unknown, a stranger joins him. As they travel on together, Tobias encounters a fearsome fish, a beautiful girl, a bag of silver, and a wicked demon. Without the stranger's help, Tobias might never make it home. 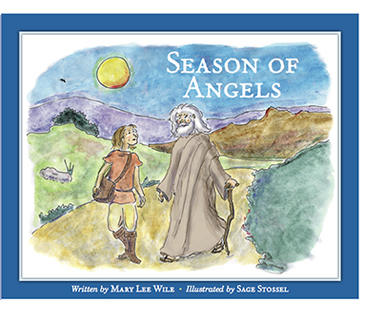 Adventure, companionship, romance, and fear are all woven into Mary Lee Wile's adaptation of the Book of Tobit, and are enhanced by the whimsical watercolor illustrations created by award-winning cartoonist Sage Stossel (Wile's niece). Together they have crafted a lively picture book that will delight readers of all ages. Order the book directly from the publisher, or from from Amazon. Also see their previous children's book, Star of Wonder—an Epiphany story. Visit the Star of Wonder web site. 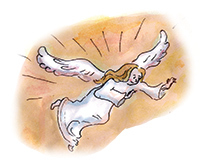 Season of Angels invites children and their families to share the mystery and the comfort of angelic companionship. The suggested music, crafts, and activities offered here can help enhance your child's awareness of God's loving presence. Those interested in learning more about Michaelmas can check out the "Background" section of the website. Below you'll find some of the illustrations from Season of Angels, which you can print. In the book, these pages are in color, but the versions here are black and white so children can color them however they like.